5x HOT FIREPol® Probe Universal qPCR Mix is optimized for real-time quantitative PCR assays and contains all the components necessary to perform qPCR, with the exception of template, primers, and probe. The qPCR Mix contains optimized components and HOT FIREPol® DNA Polymerase supplied in a proprietary reaction buffer that enables efficient amplification of AT-rich, regular and GC-rich (up to 75%) targets. HOT FIREPol® Probe Universal qPCR Mix is optimized for DNA/LNA hydrolysis probes based on the 5´–3´ exonuclease activity. 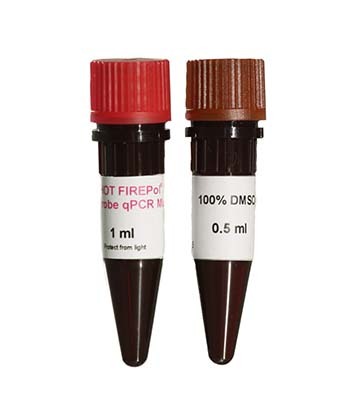 HOT FIREPol® DNA Polymerase is activated by a 10 min incubation step at 95°C. This prevents extension of non-specifically annealed primers and primer-dimers formed at low temperatures during qPCR setup. 08-17-00001 1 ml 5x PDF PDF PDF 37 EUR Login to buy! 08-17-00008 8 ml 5x PDF PDF PDF 280 EUR Login to buy! 08-17-00020 20 ml 5x PDF PDF PDF 680 EUR Login to buy! The unique composition of the qPCR mix supports robust amplification of broad range of targets from regular to GC-rich. qPCR performance in a duplex reaction: two genes from human gDNA were amplified in duplex reaction using HOT FIREPol Probe® Universal qPCR Mix. Excellent results were obtained from four 10x dilutions (starting from 10 ng/µl) from each gene. BAIP3 (blue) efficiency 100% and GAPDH (yellow) efficiency 98,4%. Reactions were performed on Applied Biosystems ViiATM 7 Real-Time PCR System. Highly competitive qPCR mix: Five 10x dilutions of 197 bp long fragment of B4G4 gene with GC-content 75,6% were ampified from human gDNA using 5x HOT FIREPol® Universal qPCR Mix (blue) and qPCR Mix from another vendor (red). Reactions were performed on Applied Biosystems ViiATM 7 Real-Time PCR System following cycling protocol recommended by suppliers. ROX is an internal passive reference dye used in some qPCR cyclers to normalize the fluorescent reporter signal generated in qPCR. It does not have any inhibitory effect on cyclers that do not need normalization. Shipping and temporary storage for up to 1 month at room temperature has no detrimental effects on the quality of 5x HOT FIREPol® Probe Universal qPCR Mix. FIREPol is a trademark of Solis BioDyne. Before testing, please consult Product Testing Manual.